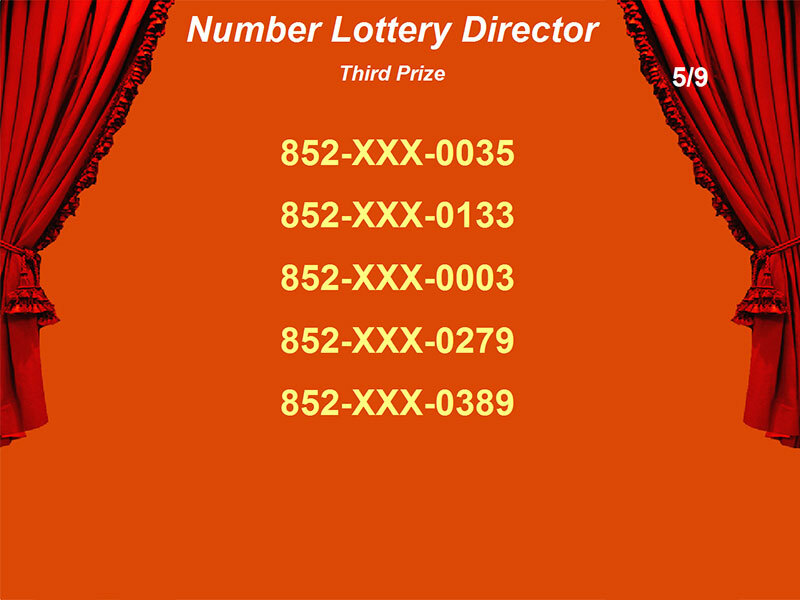 With Number Lottery Director you can create and manage your own lottery with numbers, texts. It is a perfect tool for evening and party. A lottery contains up to 99 scenes with certain sequence, every scene has its own title, subtitle, picture, music, number group and so on. Random winners are drawn from the number group in each scene, you can set winner quantity and winner columns in each scene, both font and color of winners, title, subtitle can be changed. Create and manage unlimited lottery projects. There can be up to 99 scenes in a lottery. Each scene has it's own music file, supported audio format including MP3, WAV, WMA, MP4, M4A, AC3, OGG, FLAC, AAC, AU, VOC, M3U. Each scene has it's own picture, supported picture format including BMP, JPG. Each scene has it's own title and subtitle with different font and color. Each scene has it's own source number group. Layout of lottery is configurable. Rolling number before winners are drawn. Optional animation before winners shown. Draw all or part of winners every time. View winners already drawn in current scene. Winners in each scene can be arranged up to 20 columns. Preview is supported, it will help you to check if all data is set correctly. Supports import numbers (or text) from text file and Excel file. Supports batch creating number with pattern and wildcard. Part of winner's number can be replaced with other characters. There will not be duplicate winners in a lottery. Export winners to text file or Excel file. Once a lottery is created, it can be reused. Winners are saved to database, you can query them at any time. 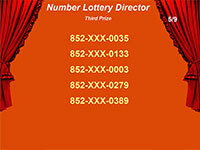 The trial version allows you to evaluate all features of Number Lottery Director. There will be a nag screen and trial marker in trial version.